The entrance is in Abbots Lane, a side road to the left, as you look at the front of Old Fire Brigade Station restaurant. This initial workshop will take the form of an informal Q&A session. The aim of the workshop is to introduce London Toastmasters to the D91 Prison Volunteering Initiative. The ultimate goal of the initiative is to make the Toastmasters Educational Programme accessible to prisoners throughout the UK by setting up gavel or chartered clubs in prison. As a first step it will focus on delivering Toastmasters Speechcraft programmes in up to 2 prisons in or around London. A key objective of this workshop will be to identify a team of around 4-5 interested volunteers to organise and co-ordinate the delivery of 4-8 Speechcraft sessions each prison, starting in early 2016. As it is intended to be an informal Q&A, formal presentation will be limited in favour of time for questions, interaction and discussion. We plan to run a further workshop focussed on training confirmed volunteers in January 2016. We hope you will be able to join us on November 10 and look forward to meeting you then. Please register your attendance here so that we can anticipate the number of attendees. Toastmasters Clubs have existed in prisons in the US since 1940s. Many of the benefits are similar to other prison education programs in terms of improved employability and reduced rates of reoffending, but crucially, as a educational program run by members, prison TM clubs provide prisoners with a number of additional skills and attributes including increased self-confidence, organisational ability and a sense of empowerment. Most importantly, prison TM clubs offer a sustainable long-term development program, as opposed to a time-limited curriculum. View this clip on Prison Toastmasters from the TM documentary SpeakEasy to hear about the benefits from prisoners themselves. Prison Toastmasters from SpeakEasy Movie on Vimeo. Prison TM clubs in the US are supported by TM volunteers. A team of four to six volunteers is needed to launch the club for the first six meetings, and two to three to support it long-term once volunteers are comfortable going in alone. One of the most active US prison volunteering schemes is D31 (eastern Massachusetts and Rhode Island), where 25 volunteers support 15 programs in male and female. What’s the role of volunteers? District 31 Director Rick Winer DTM says, “Mentoring prison clubs has been one of the most rewarding aspects of my Toastmasters experience”. Ayana is a Forensic Psychiatrist. She has been a Toastmaster since May 2015. As a result of her experiences working in prisons in and around London, she is passionate about the benefits that the program can bring to prisoners in the UK. Although new to Toastmasters she has quickly embraced the leadership part of the program and serves as VP Education for her club, London Public Speakers. 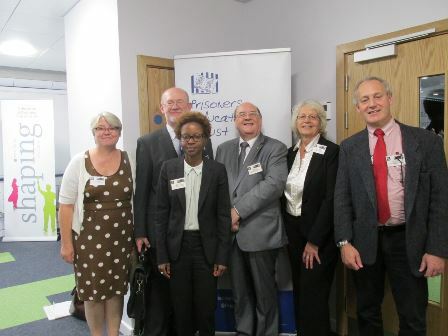 Ayana has s uccessfully teamed up with D71 colleagues to present a workshop on Toastmasters at the Prisoner Learning Alliance (PLA) Conference at Leeds Beckett University on 11 September 2015. The workshop, which was part of the theme of ‘engagement’, took the form of a ‘mini’ demonstration meeting. The purpose was to raise awareness for the TM educational program among prison staff, teachers, education managers and Heads of Learning, pique interest in bringing the program into UK prisons and establish a network of prison education contacts to support the initiative. Pictured: From left to right Sue McQueen (VPE Strictly Speaking Harrogate TM), Anthony Day (Past Division Governor, Northern England and Scotland), Ayana Gibbs (VPE, London Public Speakers), Jim Gregory (Toastmasters International Education Ambassador), Lynn Gregory (Past President, York EbOrators), Bill McQueen (Strictly Speaking Harrogate TM). Sheilagh Jones (Former Area 15 Governor), not pictured, also participated. The next steps will be to follow up with prison contacts (with an initial focus in and around London) to set up pilot programs, starting with one or more Speechcraft sessions. We will need 4-6 volunteers to run the sessions and will be holding a Prison Volunteering Workshop in London with Susan Tordella-Williams on 10 November 2015 (more info to follow). Susan has co-founded several TM programs in Massachusetts prisons and co-written a step-by-step manual on how to create a prison TM club that is available online. The purpose of the workshop will be to introduce interested TMs to the initiative and the challenges and benefits of volunteering in prison.